Prize: 2 Winners: $2,500 cash. 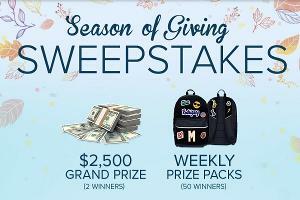 (50) Weekly Prizes available to be won, five (5) per Weekly Entry Period. Weekly Prize winners will receive one (1) Balfour branded back pack and one (1) set of ten (10) Balfour patches.The ARV of each Weekly Prize is: $100.00. What you must do to enter: complete form -- prizes are for current students.